The Tupolev Tu-114 Rossiya (Russian: Tyполев Тy-114 Poccия) (NATO reporting name Cleat) was a turboprop-powered long-range airliner designed by the Tupolev design bureau and built in the Soviet Union from May 1955. The aircraft was the largest and fastest passenger plane at that time and at 10,900 km (6,800 mi) also had the longest range. It has held the official title of fastest propeller-driven aircraft since 1960. Due to its swept wing and powerplant design, the Tu-114 was able to travel at speeds typical of modern jetliners, 880 km/h (550 mph). Although it was able to accommodate 224 passengers, when operated by Aeroflot, it was more common to provide 170 sleeping berths and a dining lounge. In 14 years of civilian service, the Tu-114 was reported to have a high level of safety and reliability. The Tu-114 carried over six million passengers before being replaced by the jet-powered Ilyushin Il-62. 32 aircraft were built at the Kuibyshev aviation plant (№18) in the early 1960s. In response to a directive No.1561-868 from the Council of Ministers and Ministry of Aircraft Production order No.571, issued in August 1955, the Tupolev Design Bureau was to create an airliner that had a range of 8,000 km (4,971 mi), based on the Tupolev Tu-95 strategic bomber, powered by four Kuznetsov NK-12 engines driving contra-rotating propellers. The Tu-114 used the basic wing, empennage, landing gear, and powerplants of the Tu-95 bomber, mated to a totally new pressurized fuselage of much larger diameter. To cope with the increased weight, increased landing flap surface area was required, and the flap chord was increased compared to the bomber's flaps. The wing was mounted low on the fuselage, giving the Tu-114 a much higher stance on its landing gear than the bomber. As a result, a new nose landing gear strut was required, although the main landing gear remained unchanged. The Tu-114 was able to reach speeds typical of modern jetliners (880 km/h), but its cruising speed equivalent to Mach 0.71 was markedly lower than equivalent jet airliners such as the Boeing 707, Douglas DC-8, and Vickers VC10, which usually cruised at Mach 0.83. It carried up to 224 passengers in maximum carriage configuration, although a more usual number for long-distance transcontinental flights was 170 passengers, which enabled the planes to be fitted with such luxuries as sleeping berths and even a dining lounge for the upper-class cabin. the most powerful turboprop engines to enter service on any aircraft, the Kuznetsov NK-12MV, each driving two AV-60H, contra-rotating, four-bladed, reversible-pitch propellers. Lower deck galleys. A dumbwaiter connected the galley to the upper deck; originally, a member of the crew was a chef. Lower deck aircrew rest area. Long landing gear (the nose gear was 3 meters high) due to a combination of a low wing and its large propeller diameter. Many destination airports did not have steps tall enough to reach the Tu-114's cabin door because of this. Early Tu-114s were also unique within Aeroflot for their three-class layout, differing in comfort: economy, first and deluxe. In the front economy cabin were set 41 (3×3) seats, the middle first-class cabin had 48 seats with tables and table lamps, followed by four compartments for 24 day or 12 beds and the third cabin located 54 passenger seats in a 3×3 arrangement. Later, these compartments were dismantled and replaced with the usual passenger seats. The design was not without shortcomings. Passengers on the Tu-114 endured high noise levels (108–112 dB) and vibrations from the propellers and engines. 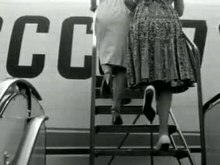 Video of a Tu-114 landing at Amsterdam Airport Schiphol in 1964. Dutch newsreel. 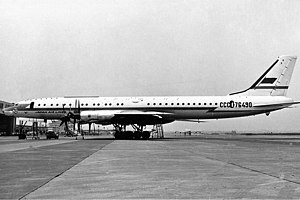 The first Tu-114, registration CCCP-Л5611, was first shown to the West in 1958 at the Brussels World Exhibition. It later carried Nikita Khrushchev on his first trip to the United States in September 1959, the first such visit by any Soviet leader. The Tu-114 was still in the testing phase and had completed its first long range flight only four months earlier, after which postflight analysis found that hairline cracks had formed in the engines. Trusting the Soviet leadership to a still experimental aircraft was risky, but the only other option for a flight to the United States would be the short range Il-18 which would require multiple fueling stops. Although the Central Committee, Minister of Defense Malinovsky, and Khrushchev's personal pilot all considered it too risky to use the new aircraft, the Soviet premier insisted and aircraft designer Andrei Tupolev felt confident enough to put his son Alexei on the flight. During Khrushchev's flight, a group of engineers were aboard the plane operating diagnostic equipment to monitor the engines and verify that they were functioning correctly. Khrushchev later said, "We didn't publicize the fact that Tupolev's son was with us" for "to do so would have meant giving explanations, and these might have been damaging to our image".. When it arrived at Andrews Air Force Base, the ground crew found that the aircraft was so large and its landing gear so tall that they had no passenger steps high enough to reach the forward hatch. Khrushchev and his party were obliged to use the aircraft's own emergency escape ladder. The last flight of this particular plane was in 1968, and it is now on display at the Central Air Force Museum at Monino, outside of Moscow. Similar issues were experienced when the plane first landed at London and Paris airports, neither of which had hosted a plane of this size. The Tu-114 entered regular Aeroflot service on flights from Vnukovo Airport in Moscow to Khabarovsk on 24 April 1961. It was subsequently used for Aeroflot flights to international destinations including Copenhagen, Havana, Montreal, New Delhi, Paris, Belgrade and Tokyo (in co-operation with JAL). Flights to Havana via Conakry in Guinea began 10 July 1962. After the United States government placed political pressure on Guinea, landing rights were denied after four flights, and the Tu-114 service had to be routed through Dakar, Senegal instead. Further American pressure to isolate Cuba resulted in denial of landing rights after three flights, and the route was changed to Algiers, Algeria instead. After three more flights, Algiers was also closed to the Tu-114. To overcome this, the Tu-114 was specially modified into the long-range Tu-114D variant, with seating reduced from 170 to 60, and 15 extra fuel tanks added. These aircraft refueled at Olenya near Murmansk, in the far north of the Soviet Union, and then flew via the Barents Sea to Havana. Usually, this fuel load was enough, but in case of strong headwinds, an emergency refueling stop in Nassau in The Bahamas was necessary; this was an American military field. All planes operating this route were converted back to normal specifications after the jet-powered Ilyushin Il-62 began flying the Moscow–Havana route. The May 1967 OAG adds the weekly flight to Tokyo taking 10:35 and the return to SVO in 11:25. Ilyushin 62s took over the Delhi and Montreal flights in 1967 (though the August 1968 OAG shows a weekly SVO-YUL-HAV Tu-114 along with a weekly Tu-114 via Algiers). Ilyushins took over the Tokyo flight in May/June 1969 and Havana, probably sometime in 1969. With the increasing use of the Il-62, the Tu-114s were shifted to long domestic flights from Domodedovo to Alma-Ata, Tashkent, Novosibirsk and Khabarovsk. Tu-114s were also used for charter operations for senior officials of the USSR and various official delegations. The Tu-114 had a short commercial service life compared to other Soviet airliners, being operated on regular flights from 1962 to 1976 (in comparison, the Il-62 is still in civilian service 47 years after its introduction, as of 2014). The fatigue life of the airframe was set at 14,000 flying hours. Most of the aircraft passed this point in 1976. By the summer of 1977, Aeroflot decided to scrap 21 aircraft at the same time. A few continued in use by the Soviet Air Forces until 1991. The Tu-114 was known for reliability, speed and fuel economy. Tu-114 burned 5,000-5,500 kg/hour of fuel at cruise flight. Its safety record was rarely matched: there was only one accident involving fatalities, but the plane was not airborne at the time. It was only withdrawn from service after the introduction of the Il-62 and after carrying over six million passengers with Aeroflot and Japan Airlines. For the Moscow–Tokyo route, Japan Air Lines made an agreement with Aeroflot to use the Tu-114. The flight crew included one JAL member, and the cabin crew consisted of five each from Aeroflot and JAL. The seating was changed to a two-class layout with 105 seats, and the aircraft livery included a small JAL logo and lettering on the forward fuselage. The first flight was on April 17, 1967. In 1969 the Moscow–Tokyo Tu-114 flights ended and the four involved planes converted back to the 200-seat domestic layout. All these records stand, but the category was discontinued when the category was split into takeoff weight sub-groups. Similar records have been set in the new sub-groups by Tu-95 and Tu-142 aircraft at faster speeds. Tu-114 6NK-8 — projected long-range version with six NK-8 turbofan engines. Destined as an alternative to the Il-62M; never reached production. Tu-114-200 — upgrade to original Tu-114, with seating layout for 200 passengers. Almost all aircraft were converted. Tu-114D — (Dalniy, "long-range") long-range version for flights to Cuba, with fewer passengers and increased take-off weight to 182,000 kg. Three built; two were converted to Tu-114-200 standard in 1969–1970 and one was written off in 1962. Not to be confused with the Tu-116 (Tu-114D). Tu-114PLO — projected maritime strike variant armed with anti-ship missiles and naval radar. This variant was to be powered by a nuclear powerplant. The Tu-116 was a Tupolev Tu-95 bomber fitted with pressurized passenger cabins built to serve as the official government transport. The two passenger cabins were fitted into the space of bomb bays and were not connected to each other or the flight deck. The Tu-126 (NATO reporting name Moss) was used by the Soviet Air Force in the airborne early warning (AEW) role until being replaced by the Beriev A-50. Japan Airlines – In association with Aeroflot. During its service life, the Tu-114 had only one fatal accident. On 17 February 1966, Aeroflot Flight 65 attempted to take off from Moscow Sheremetyevo Airport at night in deteriorating weather conditions, after the flight had been delayed several times. The crew was unaware that snow had not been properly cleared from the full width of the runway involved. The plane's wing struck a large snow mound at speed and the propellers of the number 3 and 4 engines impacted with the runway, resulting in the aircraft veering off course and burning. Initial Soviet sources suggested that 48 of the 70 persons on board were killed, including the pilot. The aircraft was bound for Brazzaville, Republic of the Congo with a number of Africans and a Soviet trade delegation on board. Later reports give the fatalities as 21 of 48 on board. Another non-operational example was written off with fuselage damage in August 1962 at Vnukovo Airport after the nose undercarriage collapsed during servicing. Tail number CCCP-76479 was one of only three long range D models manufactured. ^ "FAI official database" Fédération Aéronautique Internationale. Retrieved: 5 September 2007. ^ "Aircraft Speed Records." Aerospaceweb. Retrieved: 5 September 2007. ^ Taubman, William (2003). Khrushchev: The Man and His Era. W.W. Norton & Co. p. 422. ISBN 978-0-393-32484-6. ^ Fursenko, Alexandr; Timothy J. Naftali (2006). Khrushchev's Cold War: The Inside Story of an American Adversary. Norton. p. 334. ISBN 0-393-05809-3. ^ "Tupolev Tu-114 Rossiya ASCC codename: Cleat Long-Range Jetliner". www.aerospaceweb.org. Retrieved 31 January 2017. ^ "Катастрофа Ту-114 ТУ МВЛ ГА в а/п Шереметьево" [Tu-114 accident near Sheremetyevo] (in Russian). airdisaster.ru. Archived from the original on 2013-04-10. Retrieved 2012-09-11. ^ Associated Press, "Airline Crash Probed By Reds", Playground Daily News, Fort Walton Beach, Florida, Friday, 18 February 1966, Volume 20, Number 10, page 1. ^ Ranter, Harro. "ASN Aircraft accident Tupolev 114D CCCP-76491 Moskva-Sheremetyevo Airport (SVO)". aviation-safety.net. Archived from the original on 3 November 2012. Retrieved 25 April 2018. ^ "Tu-104/107/110/114/124/126/134 production list" (PDF). oldwings.nl. Soviet Transports. Archived from the original (PDF) on 4 January 2017. Retrieved 13 February 2017. ^ Taylor, John W.R., ed. (1969). Jane's all the World's Aircraft 1969–70. London: Sampson Low, Marston & Company. pp. 494–495. Taylor, John W. R. Jane's All The World's Aircraft 1969–70. London: Sampson Low, Marston & Company, 1969. ISBN 0-354-00051-9. Wikimedia Commons has media related to Tupolev Tu-114. This page was last edited on 13 April 2019, at 17:52 (UTC).